Recipe courtesy of Jeff Yeung, Bento Nouveau's Chef at Pusateri's Fine Foods. Please note that this recipe calls for 1/4 cup of salt but this is to taste; at least 1 tablespoon of salt should be used. Yield: About 10 rolls. 1. Stir the water, rice, sugar and salt together in a rice cooker cooker (or cook in a pot) until salt and sugar are dissolved. 3. Reduce heat and simmer rice for about 20 minutes or until done. 4. Transfer the rice to a large bowl, preferably with a flat bottom. 5. Fluff the rice with a wet wooden spoon to loosen grains without crushing them. 6. Pour 1 cup of the vinegar over the rice. 7. Stir and fluff rice, incorporating the vinegar as evenly as possible. 8. Ask someone to stand by the rice bowl and fan the rice with a magazine while you are mixing, or use an electric fan. 9. Add more vinegar as necessary to coat the rice. 1. Lay a piece of nori on a sushi mat. Press a thin layer of rice evenly on top of the nori. 2. Spread a dab of wasabi over the rice. 3. Sprinkle with some soy sauce. 4. Lay a few pieces of 1 or several of the optional ingredients in a horizontal straight thin line across the rice, about 1 inch from the horizontal edge closest to you. 5. Using the mat to make a tight roll, roll the edge closest to you over the optional filling as tightly as possible. 6. Continue rolling away from you until a roll has formed. 7. 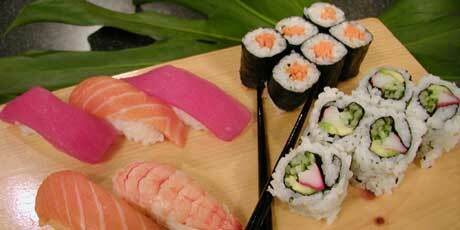 Remove the sushi roll from the sushi mat and slice it cross-wise into 1 1/2-inch pieces. 8. Serve it with soy sauce, wasabi, and pickled ginger.